Haim Vitali Sadacca, who wrote and published poetry in Turkish in his younger years, now composes poetry only in Ladino, his beloved ancestral language. The poems in the book, chosen by the author himself, express the universal aspirations of the human soul for love, affection, compassion, generosity, peace and harmony. Flowing in rhyme and rhythm, they reveal Sadacca’s skill as a poet and his mastery of the Ladino language. The unique collection is further distinguished with English translations, prepared especially for this book, by the late David F. Altabe, himself an accomplished poet in Ladino and English. 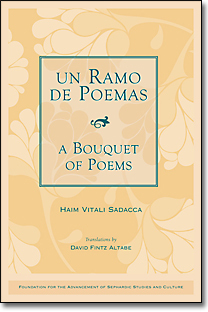 Sadacca’s poems have appeared in publications worldwide, in Ladino only, including Sephardic journals such as Shalom (Istanbul), El Amanaser (Istanbul), Los Muestros (Brussels), La Lettre Sepharade (Paris and Washington), Sefaraires (Buenos Aires), as well as on Ladinokomunita, the Ladino-language Internet discussion group with over 1,000 members. Sadacca’s poems have also been read on the air, worldwide, in Sephardic and Ladino programs such as Radio Exterior de España and Kol Israel Radio. One of Sadacca’s poems, Primer Amor, recently set to music by Reneta Sibel Yolak of Istanbul, received first prize at the prestigious Festiladino competition of new Ladino songs in Israel. Un Ramo De Poemas will be available beginning May 1, 2009.